Travis Lambert, a police sergeant with 17 years on the job, is a member of the Carlsbad Police Department. Recently, Travis, who is known for his exceptional health, developed some unexplained hip pain. This pain quickly progressed overnight into a rare and extremely serious condition, which resulted in him becoming unresponsive, intubated and critically ill in the intensive care unit. While this is a tough battle for him, friends and family of Travis find comfort knowing he is putting 110% into this fight as he does into every aspect of his life. Travis’ wife, Carrie, and his two children, 7 yr old Vincent and 3 yr old Vanessa, are in need of all the support the local community can offer. 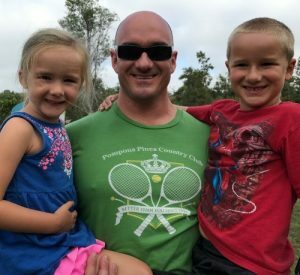 The Pint Project, Carlsbad Police Officers, and Carlsbad Firefighters have united together for the Lambert family and hope you will consider showing your support through a donation here. Sergeant Lambert has shown his dedication and love for our community through his service; let’s show him our appreciation during this difficult time.